Day 40 of writing streak. 1,200 word flash story, first draft. Tomorrow it's back to the fantasy piece. Also got some planning done on the longer project, which I plan to start this coming weekend. Enjoyed this set of 15 blog posts on the Daily Rituals of Artists over at Slate (published in April, but I just discovered it). Some of this stuff is so unlikely it might be true. 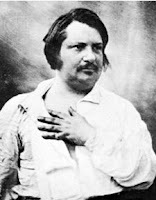 That's a picture of Balzac, by the way, who drank 50 cups of coffee a day. Good news today, no evidence of fleas (see yesterday's post for context). Looked like the various measures worked. And last but not least, running and calisthenic goals achieved for the day.